Andrew from Albany shared the above pic today on Twitter -- it's the snow-covered Albany landfill viewed from one of the Empire State Plaza office buildings. 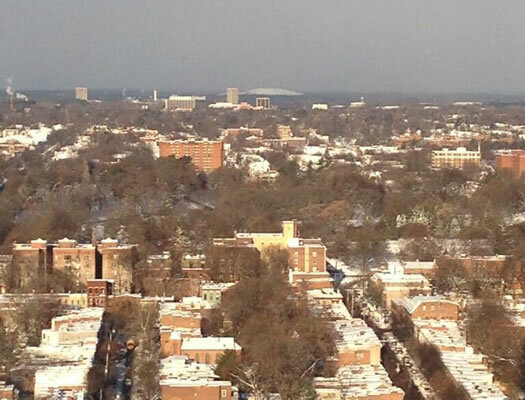 As he noted: "The #Albany dump covered in snow looks oddly like a volcano. The tourism bureau can thank me for this gem later." Mt. Fuji, it is not. Noted: Apparently the landfill-mountain-as-ski-hill idea is persistent, if elusive. But in Evanston, Illinois there is a "Mt. Trashmore" that was once used for skiing and is still used for sledding. And in Virginia Beach, Virginia there's a Mount Trashmore Park that includes a skate park. Somehow this isn't as impressive as looking across Portland, Oregon to Mount Hood. I just moved here from Chicago, just a few miles from Mount Trashmore! It's not actually all that impressive, but it's well-used, and a local landmark (remember, this is Chicago, where a 20-foot rise in the land is called a "ridge"). Will the Albany Mound be here a thousand years from now, as well? Time to start thinking outside of the mound: Build something on it like a high condo tower and sell the views! Great access to the highways and airports and the view would be impressive as well as the view of the tower would be quite interesting! And put a restaurant and lounge on top of the Corning tower to keep the reflection effect going. This area needs to start thinking big! We should be all about the future and literally build on the past!